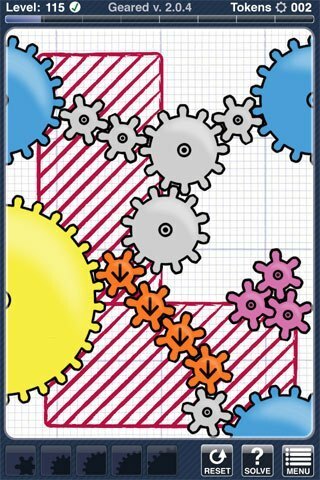 Geared is an iPhone/ iPod / iPad Touch game/puzzle app that will provide hours of entertainment. The objective is to use various sized gears to turn fixed blue gears from a fixed yellow powered gear. On some levels you can’t just place a gear but must instead drop the gear from a free zone into a no-drop zone. Other times you must carefully and patiently place the gear into position. A hint is to slowly move the gear around until it turns green whereas it can then be placed. Because of some frustration and claims of unsolvable levels we took screen shots of solutions for every level. We understand that sometimes it nice just to know what to expect from some of these tricky levels. Next week we will publish our interview with Bryan Mitchell, the developer of Geared, and share with you some other games and diversions he is currently working on. Geared Levels 1-16 Geared Lite v1.3 (FREE Version) Screen Shots and explanations. Is there anyone playing this game now? Some. Get about 5-20 visits/day. Good Work! Glad to help! Same here! I cannot get the gears to fit the distance! Have the technique to get them in general position but too much space between each blue gear. Please post suggestions! I’ve posted a step by step solution for you. Hope it helps. You have to “creep” the gears into place and it may take a few tries. where did you post the solution? Sorry, it’s live now. Just reload the solution for 161. It has 5 slides to show the progress. Let me know if I can help you further. Help!!! A week ago I did an update on geared and after that I haven’t been able to open game. It kicks me out every time. Any suggestions ??? Help!! I need a Walk-through for level 161. I have seen screen shots of the solution, but cannot get the gears to line up as shown. Please help! I’ve updated the directions to make it more clear. Any solution for level 126. That pic don’t work. Do you have the solutions for levels past 80? I have some screen shots, which one were you looking for? Hey guys I made a video with all the solution screenshots, hope this helps! Has anyone gotten to 198? Literally can’t get through it! I can’t do Level 43. 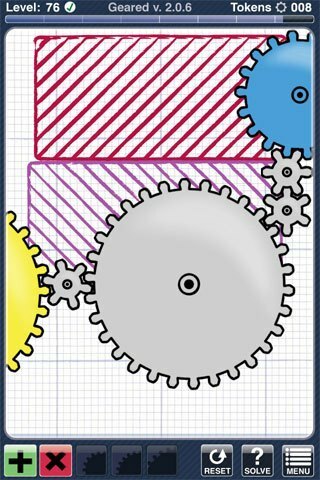 There is a red shaded box on my version that prevents placing the small cogs at the bottom up to engage with the large one. How come thee is no red box in your screen shots? is there a version of geared for personal computer? can i have a link? Any solutions to 120… Want to squash someone!!!! On level 78, i might be blind but my version only has 2 little gears and cant beat it but from 59-77 was awesome. This website helped so much and your da boss! Hi there, do you have the solutions for 81-150? They are quite difficult, I solve some of them only. Here’s my solution. Placement is very important and using the grid lines helps a lot. I remember it took me awhile to get the gears to set just right. Good Luck! Hey, any hints on 120 gratefully accepted. cheers. OK, I’ll post the solutions to lite 3.1 this week. Thanks for letting me know. I have the geared lite version 1.3 and am looking for the solutions however the solutions on your site dont seem to matc up to the ones on my ipod? My 56 is different than yours. The moving piece on the right for me is twice the size of yours. And that is where I need to drop a gear. HELP!!! I have the same problem… let me know if there is a solution! When taking solution screenshots, hide the popup window by tapping outside it. A second tap brings it back. The tricky part is dropping the first smallest gear into position and have it connect to the bottom most blue gear on the right. Once you do that the rest “falls” into place. I just tried it again and it took about five tries. If you need more help – just ask. I tried using the solution shown for level 76, but the top small gear seems too far from the blue gear. When I compare the screenshot to my level 76, it looks like my blue gear is actually higher than the one in the screenshot (making mine seemingly unsolvable). Any advice on why this would be or how I can solve his level? He’s conpletly right. It seems that with the latest update to geared they have moved the blue gear up by at least a small gears worth so matter how much you try it seems (from my 2 hours of wasted time) unable to be solved. -fail. I finished this level in about 15 minutes. You have to attach a small gear to the yellow gear and then the big gear, then between the big gear and the blue gear are two small gears. Interested in alternate solutions? I found solutions that range from slightly alternate to radically different on many of your harder levels. Might help some of the users who are stuck with those minute placements! I tried emailing you directly but your Mailto is blank. Cheers. I have spent hours on Level 76, I can get the big gear in place but cannot get the first little gear to attach to the right side of it. I’m ready to give up but want to play the last levels! Help!!!!! HI Scott! First place the large gear. Then move the slider which moves the no-drop zone up and to the right. This is when you can place the small gear next to the big gear on the right. You then have to move the slider back to place the other two smaller gears. Hope this helps. He’s right…it’s the same way on my iPhone. The Blue gear is higher on mine too. On your screenshot you can clearly see the upper right corner of the red zone. On mine that corner is covered by the Blue Gear indicating that the Blue Gear is higher, almost one small gear higher, making it impossible to solve. After downloading the new version I see what you mean. 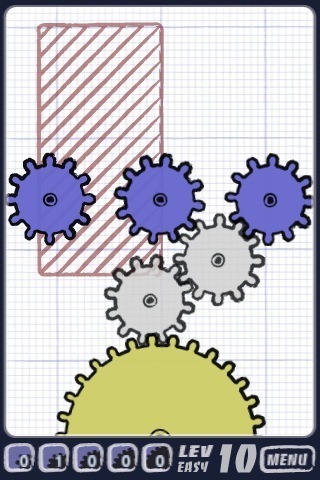 I did it by first moving the slider to the left and then placing the gears as shown. I got the first two gears moving and then finished with the last two. Let me know if this helps. Thanks for the info. I have a problem with level 59 I had reached the correct solution but the final gear will not mesh. Hi Rory. 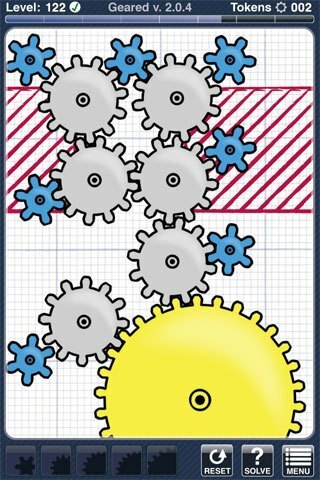 This is a tricky level and the best way to solve it is to first place the bottom three gears and get them moving. The first of the top small gears must be dropped and placed as high as possible on the big blue gear. The final small gear must then be dropped into place and mesh to get the top blue gear moving. It will take several drops to get it. Hope this helps. Hi Pearse. Level 77 is tricky because of the pixel perfect placement required for the second large gear on the right. If you have a problem placing that last gear keep moving the second gear a little left or right until the final gear meshes. It does take several tries dropping that final gear. I can help you with that Chris. I’ve posted an alternate solution for that level. 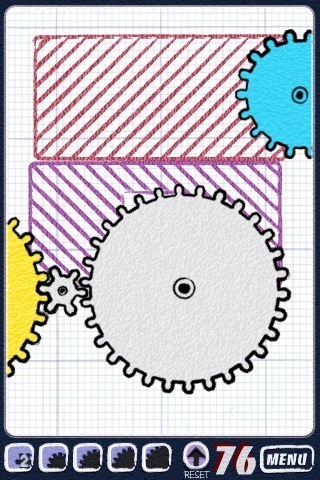 Place the first large gear on the bottom left side and get it turning. Then move the slider so you can place the second large gear on top of the first. Move the slider back and place the last gear. The gear will change from red to green when it can be placed. Thanks for you comment and I hope this helps. your solution for lev 54 is incorrect – that does not work. You’re right! I posted the wrong screenshot. Thank you for your diligence and acute observation. I have re-checked the others and they’re all correct. I couldn’t get the gears to fit for your solution to level 80 so I’ve found a different solution. There is a solution by placing the gear in the middle, but Bryan mentioned that it was taking advantage of a bug and that solution will become invalid after an update is released. I’d still like to see you solution if you want to post it. WOW…. This is the best game I ever played and now I have the solutions! Thanks Francis. It is a great game. Great solutions, really helped me out. Thank you. Glad it helped you Robbie.